Architects: Leon H. Lempert, Sr.
Once one of the largest theatres ever built for vaudeville, Shea’s Hippodrome was opened on April 27, 1914 with 3,200 seats, and was operated by Famous Players. 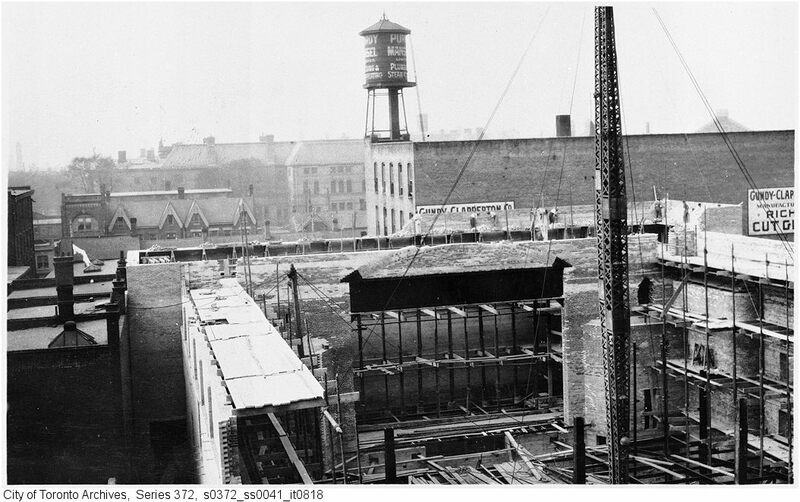 It was demolished in 1957, along with many other buildings, to make way for Toronto’s modernistic City Hall complex. 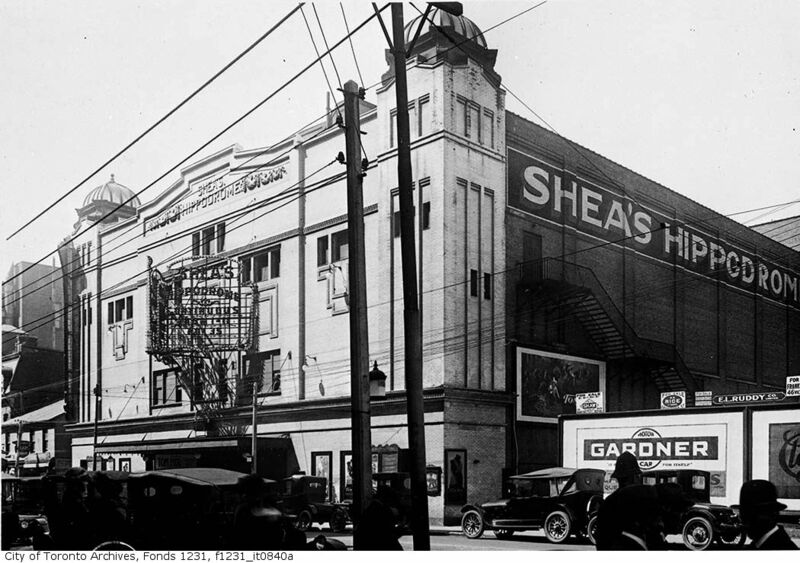 My mother was an usherette at Shea’s Hippodrome on Bay Street, Toronto in the late 1950’s. She met the likes of Gloria Swanson and Gordon Lightfoot. She recalls a photographer from ? ?Famous Players? coming in and asking if she’d do some photography of her getting ready to “go on the floor”, and she is wondering what happened to those photos. She recalls him taking photos of her sitting and putting on her hat, fixing her make up, putting on her jacket – all this was taken in the usherettes dressing room. Anyone seen any of these or have a lead where we may find them? Over at Silent Toronto, a winter shot from 1924 advertising a Gloria Swanson flick at the Hippodrome. I have Shea’s program time schedules for every show from early 50’s to closing. These are the typed timetables of starting/end times and length for News, cartoon, preview, short, feature, etc. and also size of screen when Cinemascope came in. Would anyone know if these have any monetary value to somebody, or how to find out? I also have NY Paramount “audience troublemakers” reports (mashers, pickpockets, hooligans etc.). Would these have any monetary value? Hey Jerry, drop me a line at — would love to have a look! A new article at Silent Toronto shows Lee de Forrest’s Phonofilms, featuring Eddie Cantor, playing at Shea’s Hippodrome in 1924. Updated links to some pictures I originally posted in 2009. 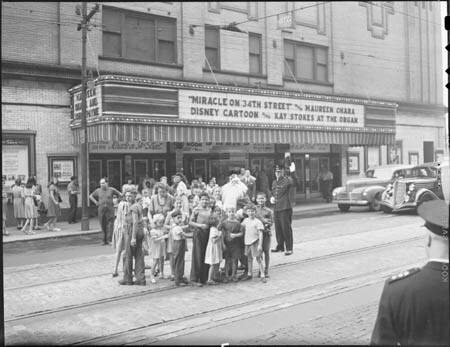 This theatre was a partnership situation between Mr. Mike Shea and the Shea family and Famous Players Canadian Corporation. I actually have a signed letter from Mr. Mike Shea advising that his doorman was on holidays and to please extend to him the courtesy of free movies should he so desire! !